The modern and silent HST™ turbocompressor features an advanced design with proven magnetic bearing technology and a high-speed motor driven through a built-in frequency converter. HST turbocompressors are widely used in wastewater treatment plants and other low-pressure industrial processes. Due to its innovative design, the small-footprint HST turbocompressor has no wearing parts nor lubricants, thus requiring minimal maintenance. The unique drive technology enables optimal operating efficiency with minimized energy consumption. 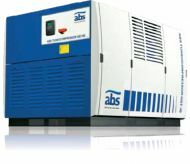 It can operate either as a single compressor or as a group of compressors via a number of interface choices, enabling remote or local control of both flow and pressure over the full operating range.